More goodies for the Argosy! Chef’s table – AKA Brett’s Birthday! Chicken noodle soup for the Halloween souls! I can’t live without sweet stuff.. Hiding leafy green veggies aka cream of assorted greens soup. 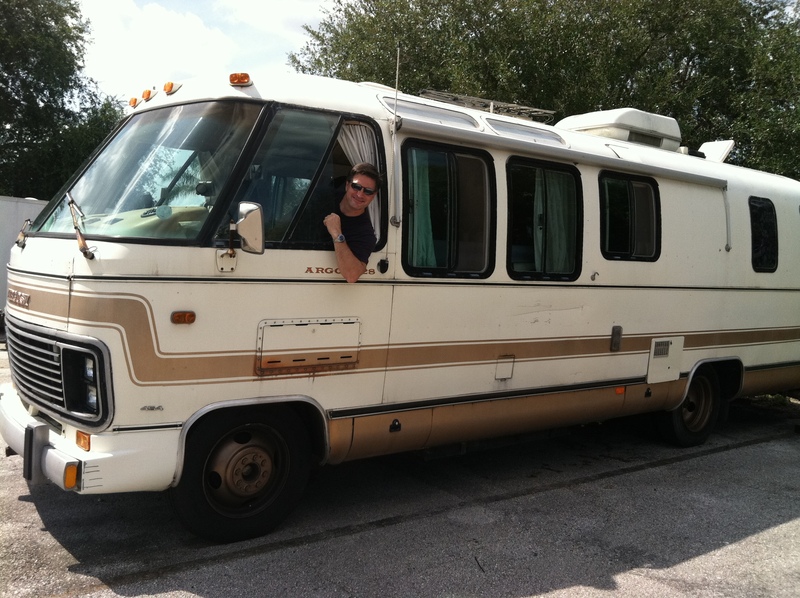 It was time to go for a ride in the Argosy. It was time for Disney! Since Brett and I had just come back from his birthday celebration and I wanted to help with this outing, I decided that I would take care of food and condiments and he would deal with the rest. So I made a menu, sent it to Brett for his ok and I was given the go ahead.. so let the cooking begin. I wanted lasagna. I wanted the lasagna that I was used to. Apparently that isn’t the same as the lasagna we all make in the US. Penny dropped. It was the lasagna I had when I lived in England. With a bit of research I was able to find the recipe that I wanted. Lists were made and shopping for lasagna ingredients and other foodstuffs for trip was completed. While I was out shopping I kept wondering why the only lasagna I had come across in the US was the one made with ricotta, mozzarella and other cheese. I decided that when I got home I would research this and find out what the difference was. Was the ricotta version an Americanized version or .. what? So I looked all this stuff up. How else will I learn and *understand* what I am doing. My research time told me that lasagna, like everything else in Italy, varies considerably from region to region; in much of the south you’ll find it made with tomato sauce and ricotta (a simpler American version), or tomato sauce and meatballs, but you can also find it made with fish, or made with greens and vegetables. However in Emilia Romagna and Tuscany, lasagna is winter comfort food, made with Sugo alla Bolognese and béchamel sauce, and an abundant dusting of grated cheese before it goes into the oven. Bingo! My preference, the one I am accustomed to is the latter version. So now I had my answer and a bit of knowledge that I didn’t have that I could include with my blogging of this meal. Since I was happy with my research and all questions were answered I started cooking this at 6 PM in the evening. I didn’t think I would have time the following day and I was right. I barely had time that night. I didn’t read the instructions very well, and part of them included simmering the sauce… for 3 hours. Whoops. I had to decide if this was actually what I was going to do – I was committed already, by the time I read the simmer part I had started the béchamel as well as the bolognese sauce. I made the correct choice – it was to simmer for 3 hours as that is what the directions said and they MUST say it for a reason. 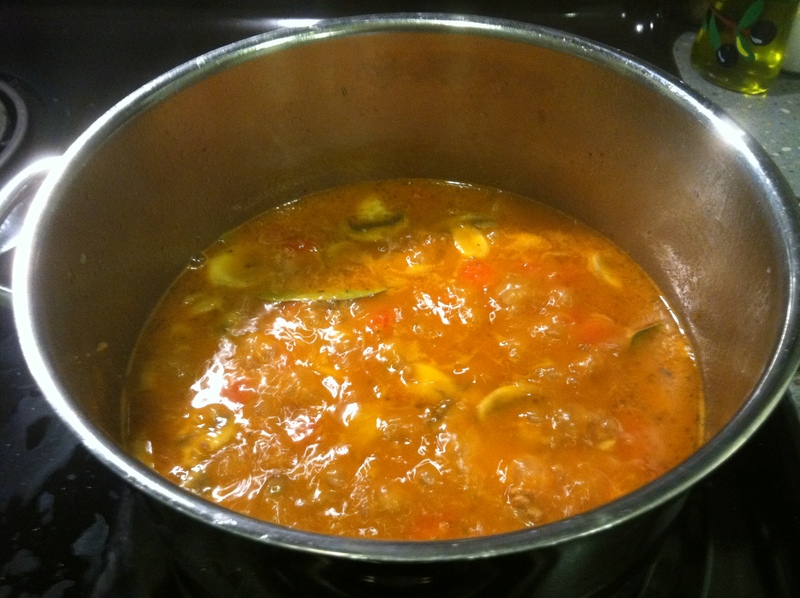 Indeed they do – while the sauce was simmering, I did more research on why am I simmering this forever, most recipes call for a simmer time of 6 hours while adding more liquid as needed. I figured I got off lightly and asked no more questions. Its an adventure this cooking thing. The result answered that question. 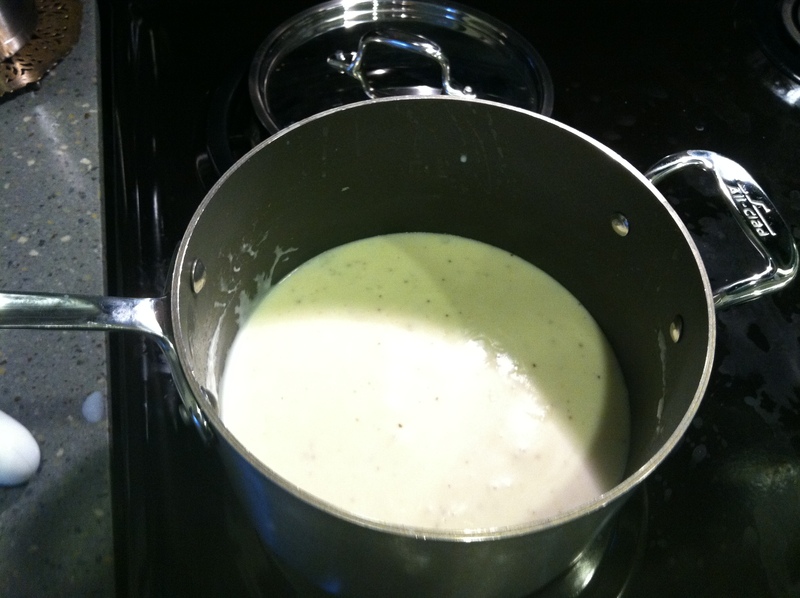 I made the béchamel sauce and refrigerated it for the time being. I didn’t want it sitting there for 3 hours and I can easily reheat it to make it soft again for layering. Also while the sauce was simmering I took care of the noodles. I used the ones that you have to boil, I realize that there is a term for that kind of noodle but I don’t think I know it right now. So everything was prepped and ready to go while I sat here for hours smelling that simmering goodness. Now that I told you my little idiosyncrasies with this recipe I will let you in on the ingredients. Again, I wouldn’t be me if I didn’t modify this one as well. * Onion and garlic are never combined in this recipe, but Brett and I both LOVE garlic so I added 3 cloves of garlic anyway. It turned out just fine, neither over powered the other. 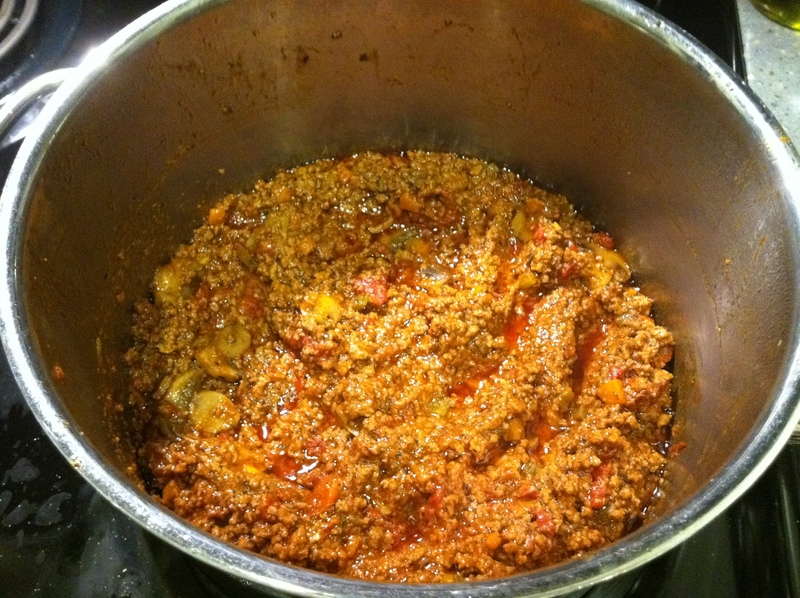 ** I found that ground chuck was awful greasy, next time I will use a leaner meat, but not to lean as the grease from the meat helped flavour the sauce, tremendously. *** These were supposed to be imported from Italy plum tomatoes, I didn’t have access to them and I had a bulk supply of Del Monte diced tomatoes with basil, garlic and oregano. They worked just fine and the addition of the spices was a welcome thing. I will go into more detail about the spices at the end. I also added a few mushrooms, because Brett just loves them. 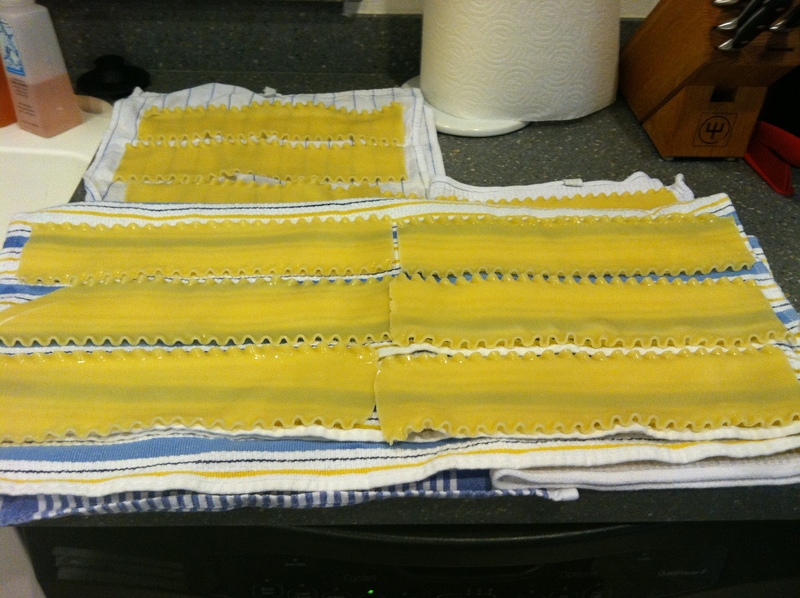 1 lb of lasagna noodles – although I don’t like this measurement – I didn’t use nearly half the noodles I made. Unfortunately I didn’t count what I did use. Put the oil and butter in a pot, and turn the heat on to medium. And the onion. Cook and stir until the onion has become translucent, then add the chopped celery and carrot. 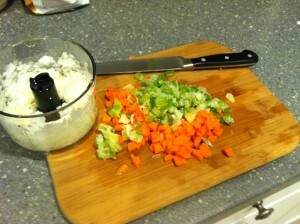 Cook for about two minutes, stirring the vegetables to coat them. Add the ground beef, a large pinch of salt, and a few grindings of pepper. Crumble the meat with a fork, stir well, and cook until the beef has lost it’s raw, red color. Add the wine, let it simmer until it has evaporated, then add the tomatoes and stir thoroughly to coat all the ingredients well. When the tomatoes begin to bubble, turn the heat down so that the sauce cooks at the laziest of simmers, with just an intermittent bubble breaking through to the surface. Cook, uncovered, for 3 hours or more, stirring from time to time. While the sauce is cooking, you are likely to find that it begins to dry out and the fat separates from the meat. To keep it from sticking, continue the cooking and adding a 1/2 cup of water when necessary. At the end, however, no water at all must be left and the fat must separate from the sauce. Taste and correct for salt. * Spices note: I added Italian seasoning, oregano, granulated garlic, basil, salt and pepper and a bay leaf which I removed. To each their own taste. Melt the butter in a pan over medium heat. Whisk in flour. Cook for 2 minutes, whisking constantly to avoid burning the flour. Pour in the milk, continue to whisk constantly until it begins to boil. Season with salt and pepper and a pinch of nutmeg. Lower the heat, cover and simmer gently for 20 minutes. Remove the pan from heat. Taste and adjust seasoning if necessary. * Bechamel note: I found that 3 cups of this were NOT enough to finish the second layer. I ended up making another cup. Adjust this as needed to do that if you feel you don’t have enough. If you’re using dried lasagna noodles then make sure the cook for 11 minutes in salted boiling water before using. Toss the noodles with olive oil and begin layering a small casserole dish by placing on the bottom of the dish one noodle, then evenly spread a layer of the bolegnese sauce and over that spread a layer of béchamel sauce, then another layer of pasta and repeat this procedure until you’ve used all of the pasta and both sauces, creating a layered effect of both the pasta and the sauces. 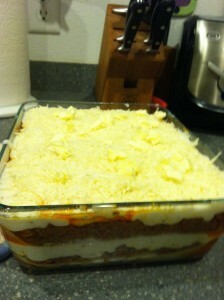 Once the top layer of béchamel sauce is spread over the top, spring over it a fine layer of grated fresh parmesan cheese. 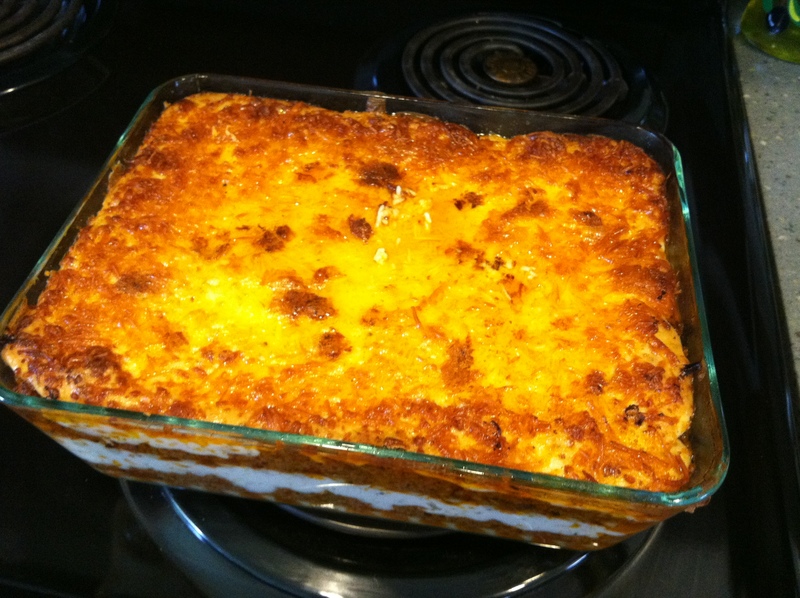 Bake for 40-50 minutes at 400 degrees or until the top layer of cheese is golden brown. It made 2 layers using the ingredients I made. 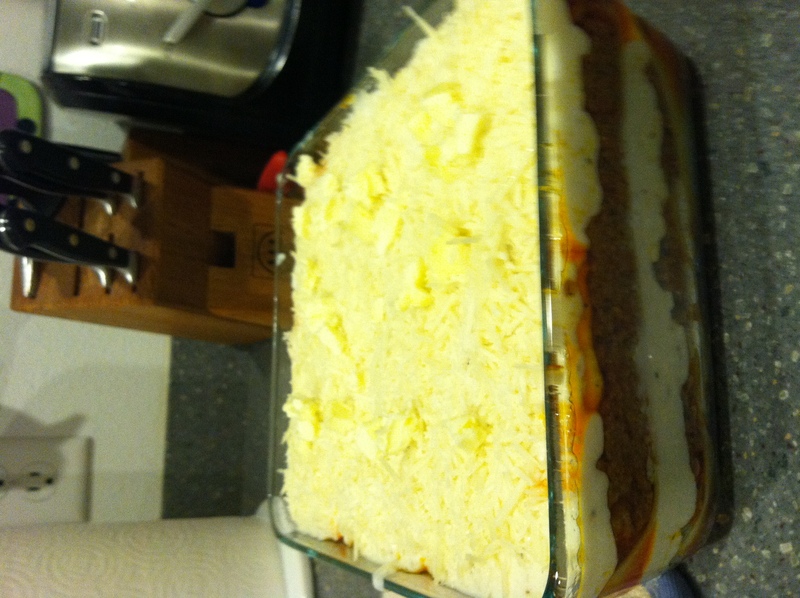 I made one more cup of bechamel sauce to finish up the top layer. If I learned one thing on this experiment it would be that I really need to read and then re-read the directions. Apparently it is delicious – it is a keeper. Maybe Brett will chime in and leave his comments below. If you have anything to add, please leave me a comment! Out of the oven!! Love that crispy top of freshly grated Parmesan cheese. For the record, I started simmering at 8 pm, at 11 it came off the stove, by 12.30 am I finally had a clean kitchen. I cooked it in the oven the next day. It was worth every HOUR. Sounds good. May try for dinner this weekend.